Talegaon, Pune, Sep 20, 2018: Dr. Subhash Bhamre, Union Minister of State, Ministry of Defence, recently flagged off five different Defence systems at Larsen & Toubro’s Strategic Systems Complex (SSC) on the outskirts of Pune. L&T is at the forefront of indigenous development and manufacturing of Defence systems, platforms, and equipment towards commitment to the government of India’s ‘Make in India’ initiative. 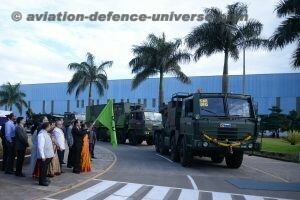 The systems and equipment flagged off during Dr. Bhamre’s visit are, PINAKA Multi-Rocket Launcher System (MRLS) – state of the art, all-weather, long-range area dominance artillery system; Pinaka Battery Command Post – a sheltered Fire Control Systems for PINAKA MRLS; indigenously upgraded Grad BM-21 Multi-Barrel Rocket Launcher – an all-weather, indirect-fire, field artillery equipment; Short Span Bridging System (Load Class 70) – an Engineering System; P7 Heavy Drop Platform System – for para-dropping equipment and logistic support, in remote areas and bases from IL-76 aircrafts. Minister affirmed keen support of the government to harness capabilities and capacities of Public as well as Private Sector towards realising the ‘Make in India’ goals. The indigenous content in the Systems flagged off by the Minister is above 90%. L&T’s journey in the Defence Sector started in the mid-1980s, as it partnered the Defence Research and Development Organization (DRDO) for the Integrated Guided Missile Development Program for realising complex weapon launch systems, and with Indian Navy in its quest towards indigenisation by developing range of equipment and systems for warships and submarine programs. With its DSIR recognized multiple research & development facilities, the company, provides indigenous solutions such as Submarines, Warships & Armoured Systems, Naval and Land-based Missile Launch Systems, Fire Control Systems, Land & Naval Engineering Systems, Artillery & Air Defence Systems, Missile sub-systems, Radar Systems & Sensors, Secure Military Communication, Avionics & Aviation Systems, Unmanned Systems across Land, Naval & Air domains, and Electrical, Electronic & Automation systems for the Defence sector.